Whether it is time for bed or time to chug this Beer Stein is a great way to carry your favorite beverage at any time of the day. This plastic stein can hold 14 oz of your favorite beer or drink. This plastic is very durable and difficult to break so it can withstand the craziest of parties. 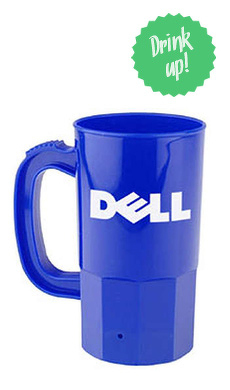 This customizable stein can have your personalized logo or image added to it to show of your company. This is a great way to promote your business at games, fundraisers and even weddings. This affordable steins can have your custom image on both sides of the stein so it doesn't matter which hand you hold it in. Your plastic stein is proudly displaying "Made in the USA" and is made recyclable. Also comes in 22oz stein and 32oz stein.